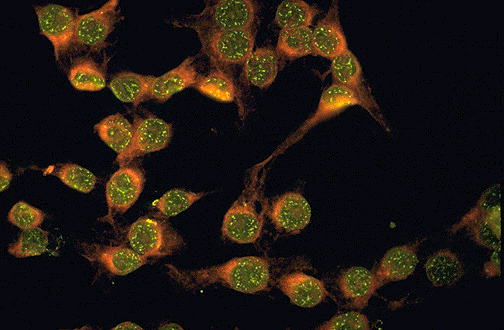 This is the so-called "speckled" pattern of antinuclear antibody test staining which is more characteristic of the presence of autoantibodies to extractable nuclear antigens (ENA), particularly to ribonucleoprotein. This pattern is not very specific, but may be seen with an entity called "mixed connective tissue disease" (MCTD) which is an "overlap" condition that is a mix among SLE, scleroderma, and polymyositis features, but without serious renal or pulmonary disease. The autoimmune diseases are very hard to classify, even for the experts.